Looking for original programming for your next HR conference or program? 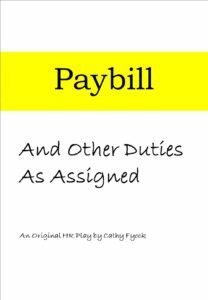 Cathy Fyock’s original play, And Other Duties As Assigned, was performed as the opening keynote for the KY SHRM Conference to high accolades! This was so much fun. The cast put their all into it and took a great play and brought it to life . . . well maybe larger than life in some cases. Thanks Cathy for sharing your play with us. To view the video trailer, follow this link. For more information and to book this play for your next learning event, contact Cathy Fyock.